Today is my last day with Ester for this trip. We concentrated on final things that needed to happen for me to hike. We got the final groceries. We tried a pan of protein bars I wanted to try. They aren't very good, but now I know that. We did laundry. The bullfrogs didn't mind the rain. 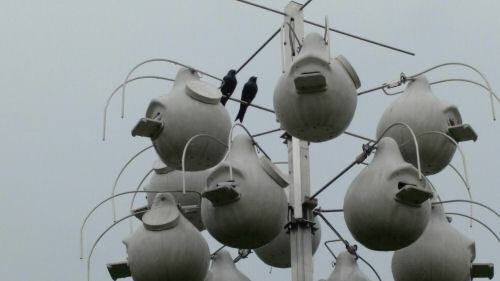 The lawn has a number of purple martin houses. I was carefully stalking the birds I saw on top so as not to frighten them away. The joke's on me! 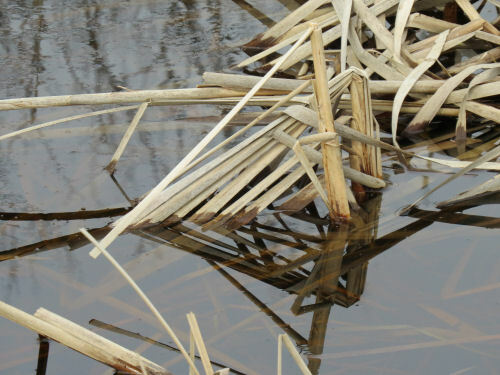 When I got close enough to really see them I realized they are decoys! We did see some real martins fly in while we were eating. And on the way home we also saw a number of sandhill cranes standing in a field. But I didn't have the good camera with me. 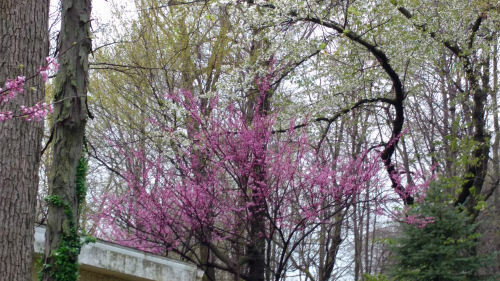 The rain and gray skies made the colors of the redbud pop. Tomorrow night I'll be at the campground with Marie. Hope to blog fairly often from the hike. We'll see. At least I'll put a picture a day on Facebook. 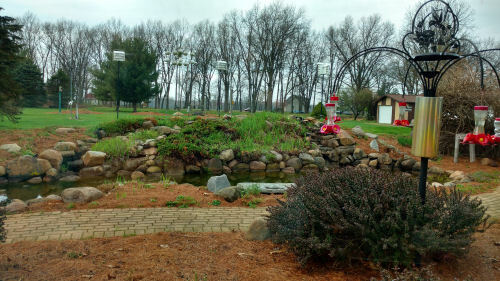 I'm loving a walk through Ester's woods and flower garden in the evening. 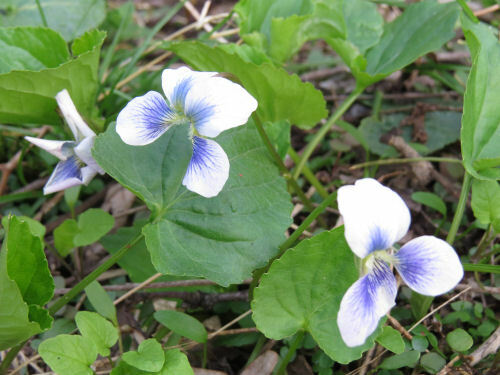 I love the little confederate violets which are everywhere. 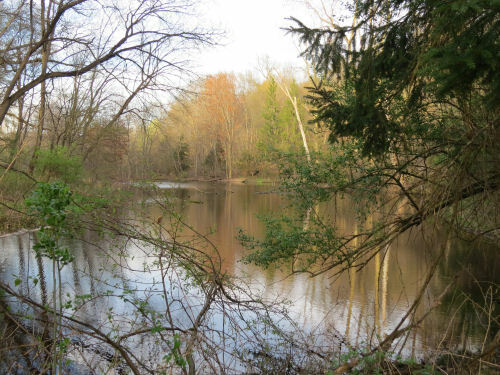 Ester also has a pond. It really makes the property something special. 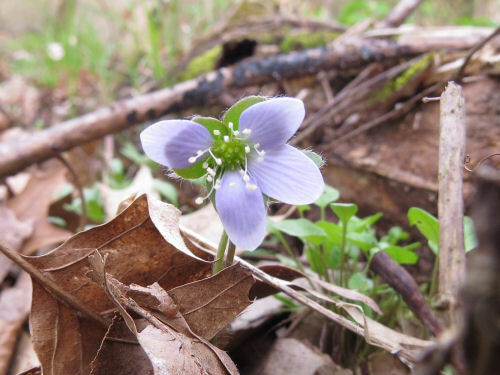 I found one lone hepatica. 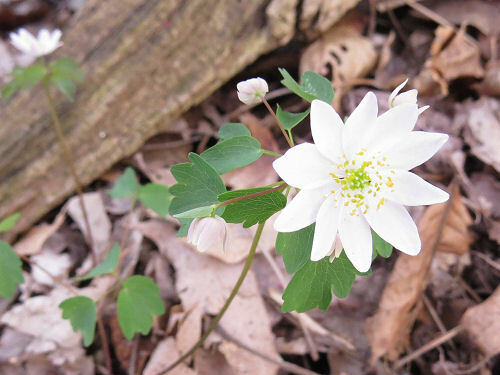 But there are lots of the delicate wood anemone. 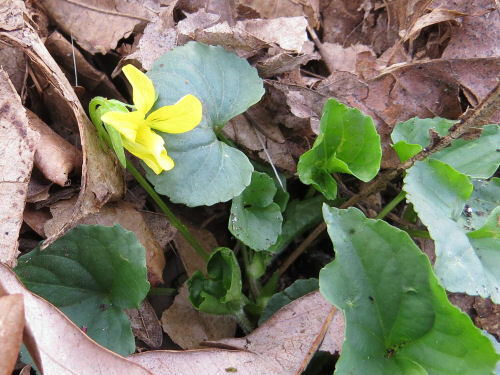 Purple violets everywhere too, but also a lot of yellow violets. 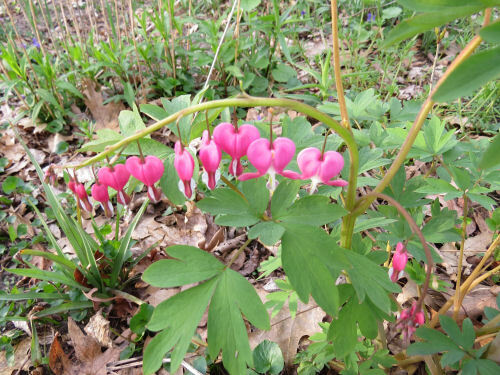 And in her garden, bleeding heart. What a wonderful start to this vacation! It's been a calm and fun day with Ester. She's 150 miles south of me, and at least I'm getting a dose of spring here. 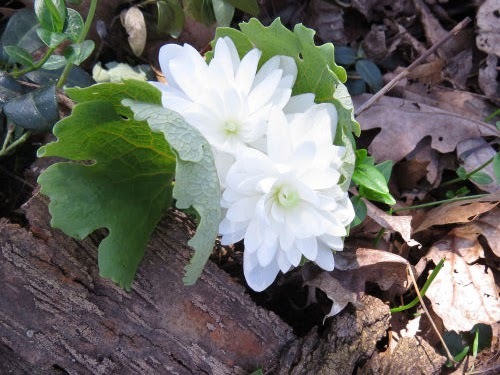 She really likes her double bloodroot. I had to look this one up. 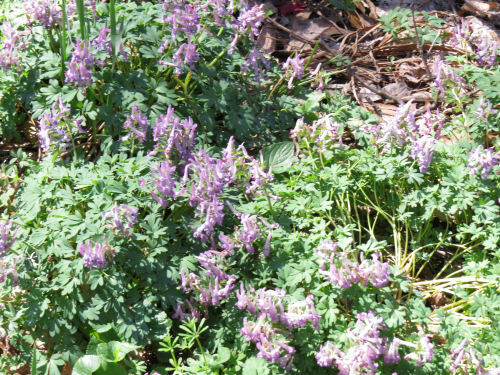 Sure looked like a corydalis, but I didn't know there were purple ones. Indeed, there is one, a garden variety called 'Blackberry Wine.' She says it appeared probably part of the rootball of something else she purchased. 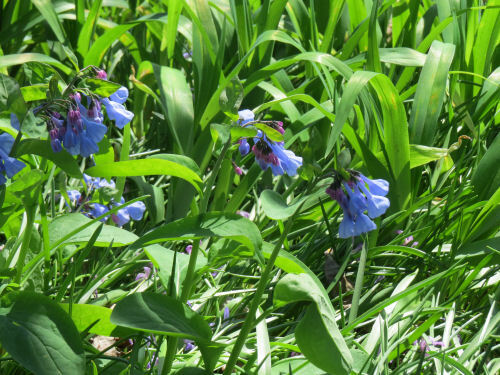 One of Ester's favorites, Virginia bluebells. 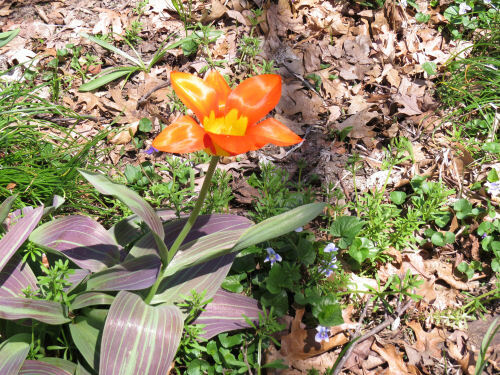 And, one lone tulip with striped leaves, no less. Just getting ready to go out the door to head to Ester's. Handbells today were awesome. I got more pictures of the plant I've been teasing you with, but will post another time. Gotta go! Today it was suddenly spring. 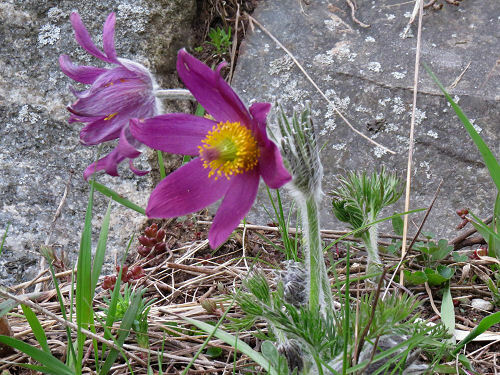 Pasqueflower blooming in the remnant of my rock garden. The problem is, I'm going to southern Ohio for the next two weeks where it's pretty much summer already. 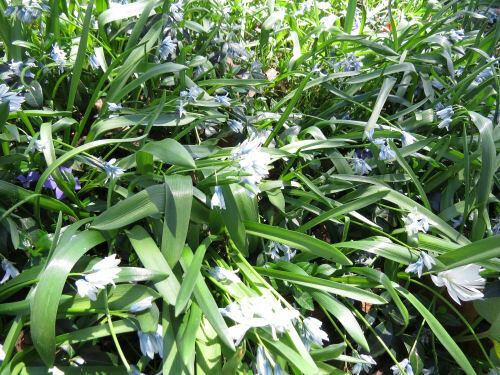 Spring is just starting here, and will be well along when I return. I've planned myself into missing spring this year. That wasn't the smartest move I've made, but the dates just worked so it will be what it will be. 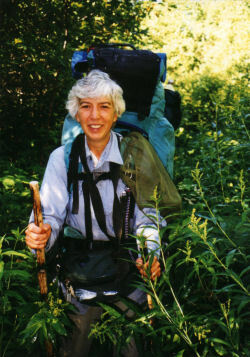 The really nice thing about today is that the Manistee National Forest awarded the Enduring Serivce Award jointly to the Western Michigan and Spirit of the Woods chapters of the North Country Trail Association for our many years of partnership to maintain the 120 miles of North Country Trail through the Forest. 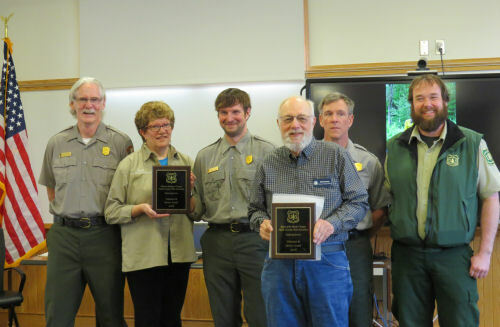 In the picture (L-R) are Mark Weaver (National Park Service), Beth Keloneva (President WMI) with their plaque, Luke Jordon (NPS), Bob Dunning (President SPW) with our plaque, Chris Loudenslager (NPS), and Dave Jaunese (National Forest Service). We told a lot of mutual trail tales and sharing the good things that have happened because of these partnerships. And, everyone in the chapters who wants one also gets a patch. You know I wanted mine! This award is kind of a big deal, so I'll gladly share it with you. The house is completely trashed with stuff piled in the living room, boxes of food on the kitchen floor, and half-finished projects everywhere. But there is a semi-good chance I may actually leave tomorrow. 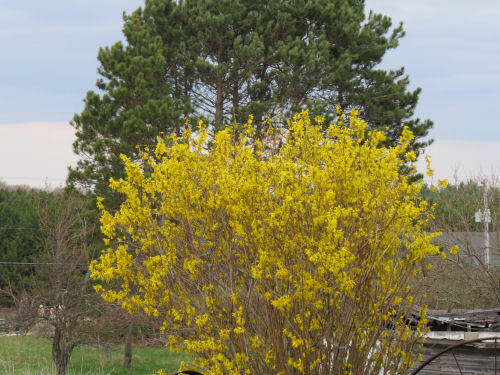 Also on my to-do list is get a new picture of the shrub I've been teasing you with. You'll see that tomorrow, and then I'll be on my way to spend a few days with Ester before meeting Marie to hike. I should be able to blog most days with the phone as a hot spot. Yes, I have a new toy. What is it? 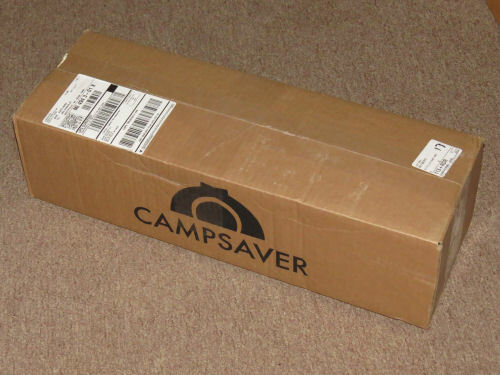 Of course you can read the name of the company I ordered from on the box and get a big hint. It should properly be used outside. Maybe you guessed that. Lay it out and assemble the poles. 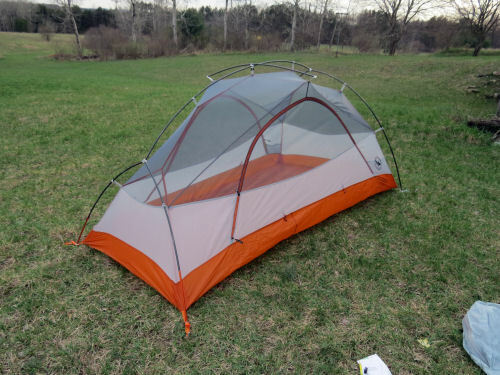 Yup, it's a new two-person tent. I've now owned a number of tents in my lifetime, but this one replaces my all-time favorite two-person one. You've seen it many times. It was the blue Sierra Designs Half Moon. But it was 25 years old, and it took its last trip in Vermont. The company replaced the poles twice, for free. I'd replaced the netting in the door. I also replaced the zipper once. However, one of the poles has now split again, and the fabric itself is beginning to get tiny pinholes. I can't complain a bit... it has served many years and miles. But it was my favorite. It cost $235 in 1992. 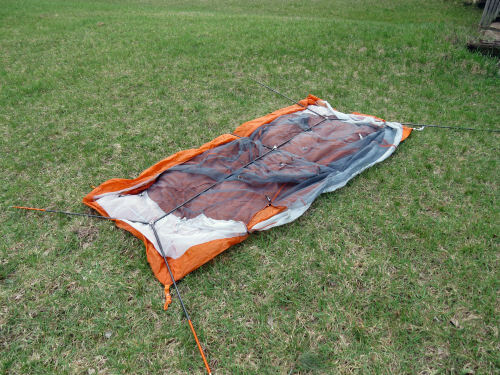 You know I love my one-person Big Agnes Fly Creek tent. So, I've been looking at their two-person tents. 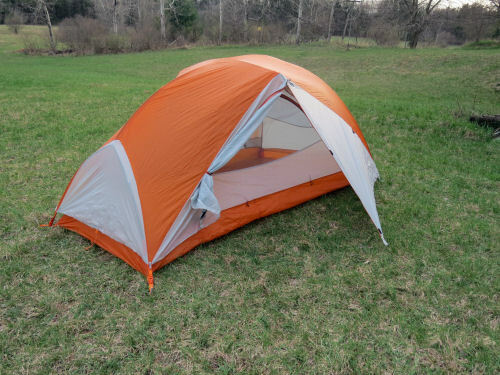 This is the Big Agnes Copper Spur, a $400+ tent, but I got it for $275 because it's last year's model! What a deal! Had to do it. They assemble easy as pie, easier actually. Making a pie is a lot of work. Here it is with the rain fly on. There are two features of this tent I'm going to like a lot. It has two doors, one on each side, so either person can exit easily. 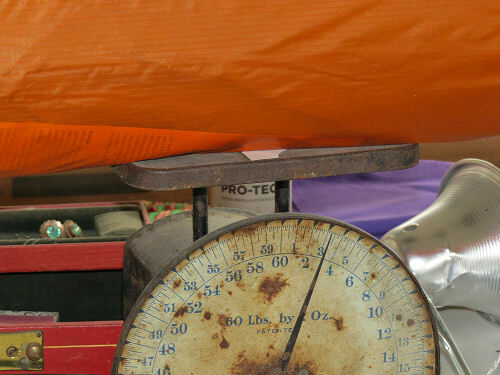 The other thing is.... it weighs just over 3 pounds with everything. That's a pound less than the Half Moon! We really like this style: rectangular (this one is slightly tapered), with a domed top and full rainfly. They shed water well even in heavy storms, and there isn't much the wind can catch either. Now, here's where you can laugh. This is not the tent I'm taking on this trip. We are base camping, not backpacking (Marie's backpacking days are over). So we'll be taking the big old green tent! It's about 23 years old. I can't find a picture of that on the blog. I probably never showed you because it's a very ordinary green Eureka dome tent. 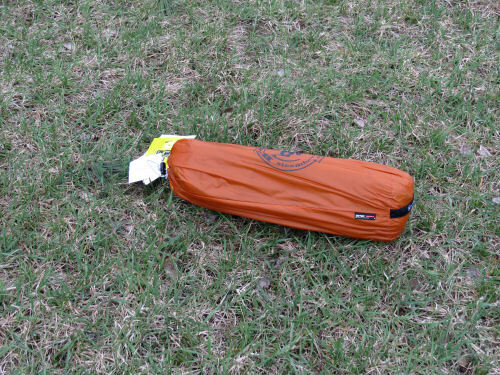 But it works well for basecamping. Not huge, but Marie (who is tall) feels less claustrophobic in it. OK... now back to getting my gear together! What Plan-it are You On? Aliens on the loose! Oh no! 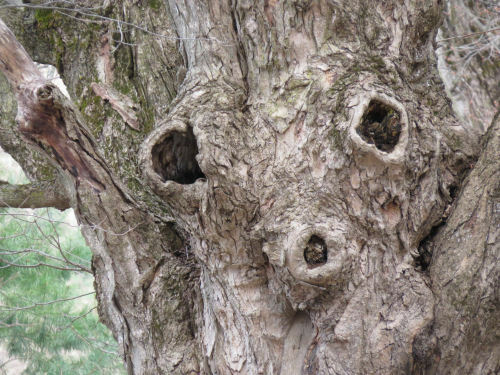 The last face in a tree I found and shared was to introduce the huge list of items I wanted to do in a year. This time the face is only startled by how blase I seem to be about getting ready to leave on this hike. I'm supposed to drive away from the house Sunday afternoon. Ha! I've already warned Ester it may not be till Monday. That's OK. I'm spending a few days with her before meeting Marie to hike. I need this time away SO much, but can't seem to get myself in gear to finish getting ready. The preparations are happening, but slowly. The food is almost done. The gear is easy because I just follow my master list, but I do have to do it! See Oh No, It's a List! See How About that List? You didn't think I was going to eliminate the silly flamingo posts, did you? They make me laugh. These are both on my road walk loops. 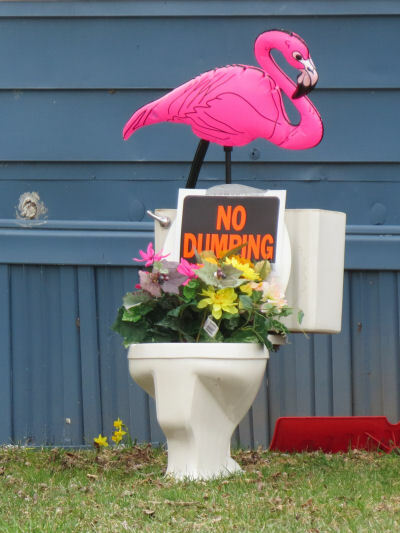 And if you gotta dump, don't do it here. 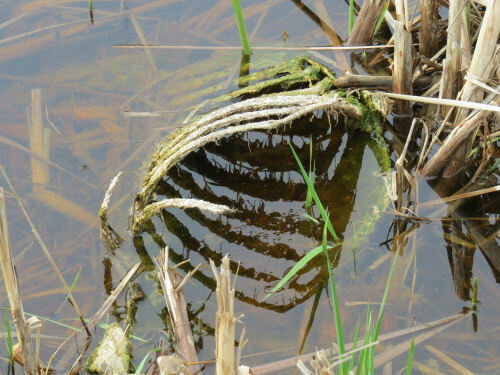 While I was walking yesterday, I saw this reflection of a broken fan of cattail leaves. I liked the way it looked, and it reminded me of ribs. Then I got to thinking about the words rib and ribbon. I wondered if they came from the same root. The answer is... probably not. "Rib" is pure Old English. "Ribbon" is more a diminutive of "band," from Indo-European "bhend," from which we get bandana, bind, bundle, bond, ribbon and more! A busy day, but had an uncharacteristic migraine headache this afternoon. Thankfully, it went away. After those few strangely warm days in February, we now can't seem to get spring to move into gear. That said, on my walks of yesterday and today there were many indications that it's trying hard. 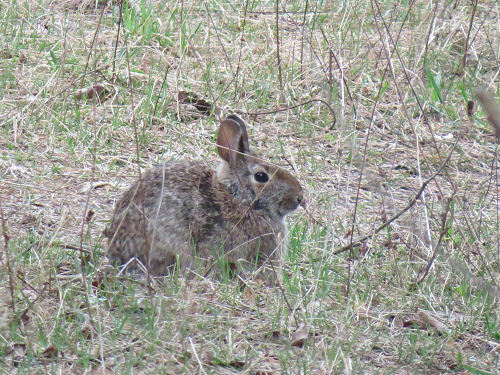 I've seen a fair amount of mammalian wildlife moving around: a woodchuck, squirrels, this rabbit. And the annual vehicular carnage has begun. Within a half mile of my house there are three dead opossums, a turkey and a porcupine. 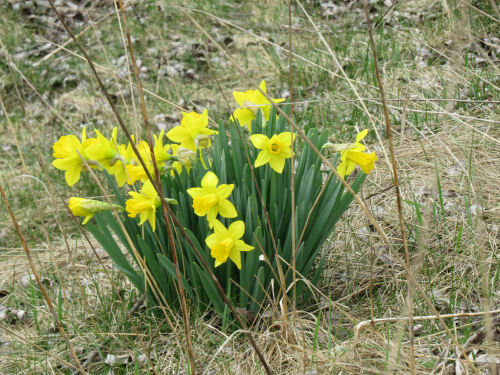 My daffodils still have tight buds, but I found these along the road. 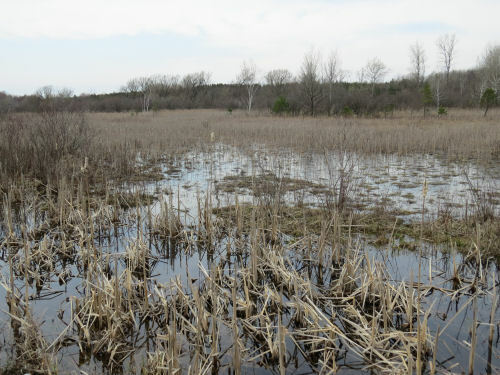 This wetland looks essentially the same as it did two weeks ago, so I'll spare you the second picture. Gray and brown. 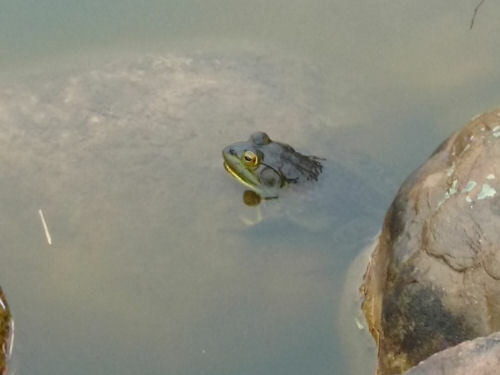 And yet, I've heard the spring peepers and also chorus frogs. 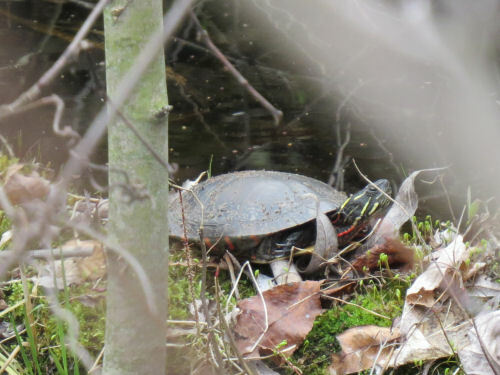 Heard a big plop today, and suspect it was one of these guys, a painted turtle. Picture taken yesterday. 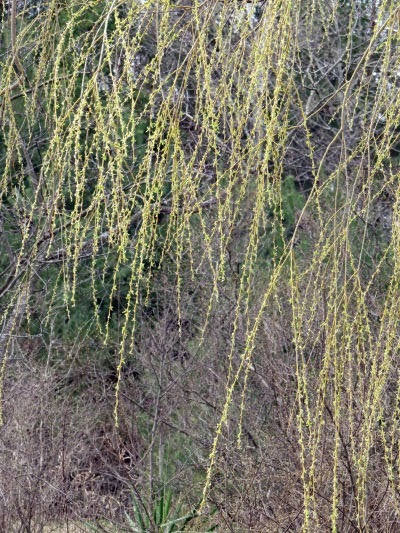 Some of the best color is the weeping willow trees, which always look like yellow fireworks while they leaf out. 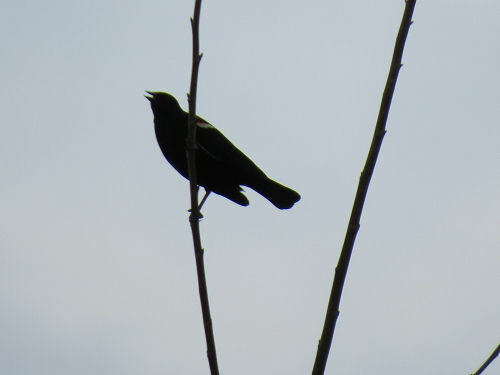 I'm hearing the early birds: robins, red-wing blackbirds, phoebes, mourning doves. 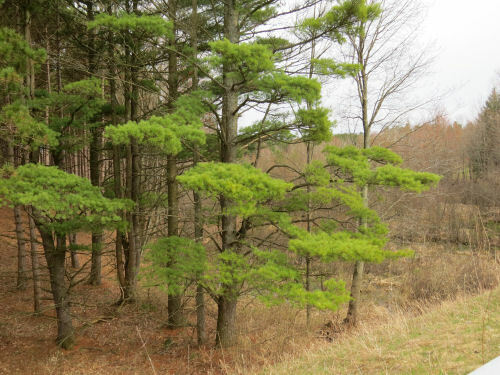 But the greenest, prettiest tree was this white pine, which of course, is green all year. The picture does show how little else has greened up yet. And yet, I brought home a baggie full of dandelion and wild carrot greens to add to my dinner salad. That's a good start, but it's double digit days of April. Time for more green! The Life and Times of...?